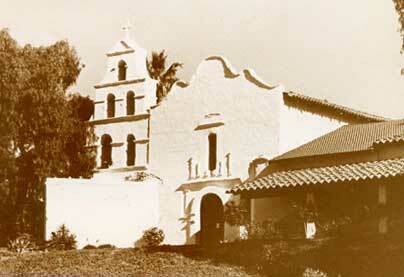 Mission San Diego de Alcalá was founded 16 July 1769 (1st in order) by Blessed Junípero Serra. The mission is named for Saint Didacus of Alcalá. The originally was founded on a site the Indians named Cosoy. The mission was moved to the present site (Indian name Nipaguay) in 1774 and was destroyed both in 1803 and 1812 by earthquakes and subsequently rebuilt. There is no active church at the mission. San Ysabel housed an asistencia to this mission. Also, consider visiting the Serra Museum located in the San Diego Presidio. The museum is located on the original site of the mission. The Serra Museum is in the San Diego Presidio Park just above Old Town near the junction of Interstate 5 and Interstate 8. If you are coming from the Mission, go West on I8. The exit directly after the Highway 163 interchange is Hotel Circle. Take that exit and make an immediate left turn under I8 to Hotel Circle South. Turn right (you will be circling Presidio Park on your left). Hotel Circle South turns into Taylor Street and just where it does this you’ll want to turn left into Presidio Park. Keep to the left up the hill and you’ll see the Serra Museum as you get toward the top of the hill. Use one of the parking lots in the area. GPS for the parking lot just below the museum is 32°45’20″N 117°11’55″W. The museum is the building at the top of the hill and the landmark sign and other historical displays are just below the lower parking lot.